My name is Ryan, and I work as a graphic designer for a non-profit company called Feeding Children Everywhere. I didn't think my first step into the working world after graduating college would lead me into a non-profit, but it was the only opportunity to come up. So naturally like anyone else fresh out of art school, I took the job by the neck and prepared for the next part of my life to take me away. Which ended up being an internship. But only for a month! I was then hired on staff as the first "official" graphic designer for FCE. For a company of only 2 years, I was filled with question, and excitement. How did they possibly strive this long without a designer?Though I was curious, I was still brand new to the company, and very eager to create. I had to first learn the do's and don'ts and what the company was all about..
Our Ceo, Don Campbell is an intelligent, loving, all around family man. He started Feeding Children Everywhere from his own kitchen table. Together with his wife, Kristen Campbell, they started having dinners with the local children in their neighborhood that belonged to struggling families who have trouble providing food for themselves. Kids would pile in their living room, growing in numbers each night, around Don's dinner table. They weren't allowed to eat or help cook, unless they finished their homework. With that, the kids started bringing their homework to Don's house, to finish it in person, just to be able to help cook the food. Curious. The local community and church started hearing word of this, and became interested. People started donating food and money to the Campbell residence, to help out. Don would walk to the mailbox to find checks and cash, donated by people who were empowered to make a difference. It was there, Don knew, that this could be something great. He had dreams that this might expand out around the country, and who knows, maybe it could even have an effect around the world.. It has now been my fifth month at Feeding Children Everywhere, and it has also been the most positively influential time period of my life. I've been able to be inspired by some of the most beautiful things that can come from human interatction. I've seen people give back things that to others, mean a future, an opportunity of their own to become somthing. The healthy meals that we're sending around the world, are coming from you. People who have lives and do their own things, but ultimately have a sense that we belong together. We have been able to provide schools, orphanges, and less fortunate parts around the world with over 10 million healthy meals in the past 2 years (for me just 5 months). Through schools, children recieve these meals, and are free to take them home to provide for their own families. Thus, more families send their children to school, giving their children better chances of growing up and changing their lives for the better. 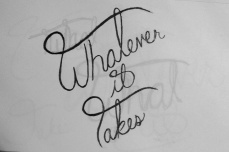 For this project, I want to create a piece that states "Whatever it takes." Inspired by the very words that came out of Don Campbell's mouth today, while having a random chat. He's always talking about visions for the future, and whenver it happens, everyone around suddenly stops to listen. I also hope that by taking this class, that I can continue to learn new things and connect with other creatives. Thank you for this opportunity!